Margarethe & Abraham Regier. Family photo. Abraham Peter Regier: pioneer and businessman; born 18 Feb. 1895 in Chortitza, South Russia, to Peter Regier (20 January 1865-21 January 1920) and Katharina (Koop) Regier (11 September 1872-17 January 1920), the second child of eight. On 13 June 1920 he married Margarethe Kroeger (27 March 1896-20 June 1988), daughter of David and Margareta (Krahn) Kroeger. Her family were makers of the famous “Mennonite” Kroeger wall clocks in Ukraine. Abraham and Margarethe were married at the groom’s parents’ home in Chortitza. They had nine children, three sons and six daughters. Abraham died 12 November 1995 in Vineland, Ontario. Abraham attended the Chortitza Zentralschule, followed by five years at the Halbstadt Kommerzschule. He was one of the 150 students, of the 3000 that had applied, that were accepted into the Gorny Institute for Mining Engineers at the university in Ekaterinoslav. His education was interrupted when he was conscripted into the Red Cross Alternative Service in 1914, where he worked as a bookkeeper. From 1918 to 1922 Abraham worked for the regional council in Chortitza. This was during the Russian Revolution and anarchist era in the Ukraine and he was imprisoned twice during this time. When he felt pressure to join the Communist Party he went to work in the Koop Factory as assistant to Armin Lehn. In 1922 when the American Mennonite Relief Administration came to the Chortitza area he was the secretary-treasurer for this organization. At this time he also became a member of the board of the Verband der Bürger holländischer Herkunft, leading the third trainload of Mennonite emigrants out of Russia to America in 1923. The Regier family settled in Alberta, north of Calgary, in 1923. In 1926 they joined several other families and moved north of Edmonton to the Peace River area, settling in Lymburn, Alberta. In these pioneering days he was instrumental in building a school, accepting the job of volunteer treasurer and making sure the teachers got paid. After a fire destroyed some of the houses he became appraiser and treasurer of the Saskatchewan Farmers Mutual Aid Society. 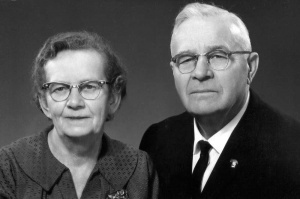 Education and church were important to Regier, so he moved his family to the Niagara Peninsula in 1943, where there were more opportunities for his children. They lived on a farm and joined the Niagara United Mennonite Church where he was a lifelong member. Due to the hard times at the end of World War II he became involved with the local farmers' co-operative in Niagara. He was a founding members of the Niagara Township Credit Union Ltd. He worked as a volunteer secretary-treasurer and then became a full-time manager of the credit union until his retirement in 1965. By 1958 the assets of the credit union had reached $1,000,000. The town of Niagara-on-the-Lake named him Citizen of the Year in 1964. With the support of his wife Margarethe, and a strong faith in God, he used his many talents and gifts in the business world. In their retirement years both Margarethe and Abraham wrote down many of their memories and experiences for the family. Klassen, Mary (Maria H.). “Abraham Regier: a rich life out of turbulent times.” Mennonite Reporter 10, no. 17 (18 August 1980): 9. Regier, Abraham. Interview by author. Niagara-on-the-Lake, Ontario (16 July 1980). Regier, Henry. Interview by author. Elmira, Ontario (15 March 2011). Klassen, Maria H. "Regier, Abraham Peter (1895-1995)." Global Anabaptist Mennonite Encyclopedia Online. May 2012. Web. 20 Apr 2019. http://gameo.org/index.php?title=Regier,_Abraham_Peter_(1895-1995)&oldid=96172. Klassen, Maria H. (May 2012). Regier, Abraham Peter (1895-1995). Global Anabaptist Mennonite Encyclopedia Online. Retrieved 20 April 2019, from http://gameo.org/index.php?title=Regier,_Abraham_Peter_(1895-1995)&oldid=96172.